Colorado's Alpine Loop Scenic and Historic Byway has a narrow window in which it's snow-free (June to September). But it's worth the wait — the 65-mile scenic drive travels through a surreal landscape of treeless tundra and mountains seemingly splashed with red and yellow paint near Ouray, Lake City and Silverton. It's important to note that the entire route is four-wheel-drive terrain, so if you're piloting the family sedan, you may want to consider switching to a higher-clearance vehicle before attempting this magnificent route. • Affectionately known as the "Switzerland of America," the high-altitude town of Ouray offers soaring mountain peaks and air so clear, every detail of the craggy pinnacles surrounding town can be seen. Because of this environment, Ouray has a citizenry that embraces the outdoors as their most prized possession. • History in the area is as intriguing as the surroundings are majestic. The story of Ouray stretches as far back as the Ute Indians who originally inhabited the area and soaked in the town's hot springs, to the boom of bonanzas and the fortunes they created. As one of the starting or ending points for the Alpine Loop Scenic and Historic Byway, it stands as a gateway to an off-road adventure. • The Alpine Loop byway navigates between the summits of the Rockies by way of two mountain passes. Engineer Pass, to the north, rises 12,000 feet and provides an unsurpassed vantage point for photographs of Uncompahagre and Wetterhorn peaks — both towering more than 14,000 feet high. On the more southern route, Cinnamon Pass also tops out at 12,000 feet and provides views of some of the nation's highest mountains — Handies, Sunshine and Redcloud peaks. 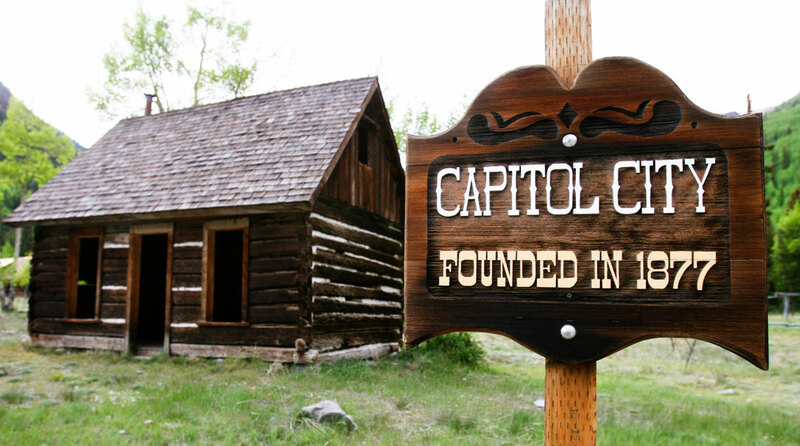 • The easternmost town along this Colorado byway is Lake City. Yet another community that claims nature with a tight embrace, Lake City is full of those who've forsaken the steel and concrete of a big city for forests, foliage and a slower pace. 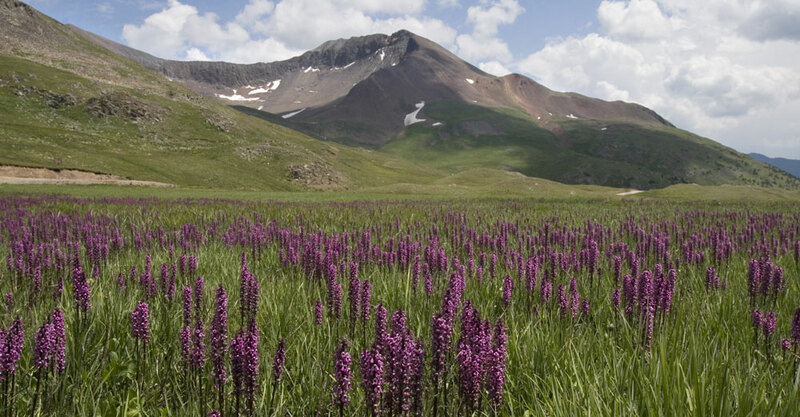 Reaching this town from either Ouray or Silverton requires a four-wheel-drive vehicle, which makes this overland route perfect for those who enjoy raw nature and have the transportation to tackle it. • As the name suggests, Silverton was once a mining town whose mines fueled the migrating interests of fortune seekers. Today, the mines have been largely tapped. But the evergreen forests, craggy granite cliffs and ample wildlife found around this quaint, alpine town draw increasing visitors — and even coax a few to stay. The History: Traveling primarily through backcountry, this four-wheel-drive route passes numerous ghost towns, including Animas Forks, where an astounding 25 feet of snow fell in 23 days in 1884. 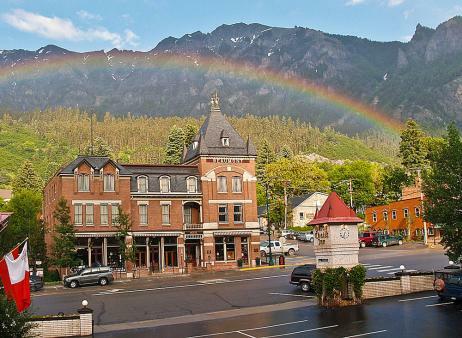 Visitors will also experience the Victorian charm of Lake City, Ouray and Silverton. Photos: Engineer Pass, Ouray (courtesy of Kane Scheidegger/Ouray Chamber Resort Association), cabin near Lake City.